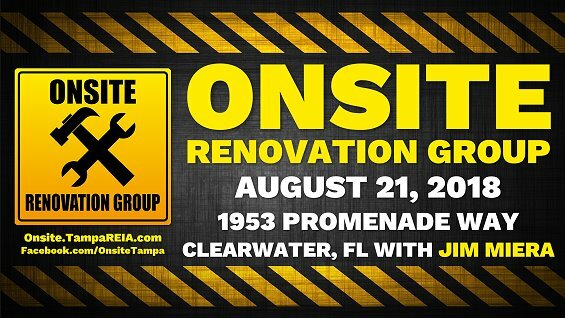 Please join us on Tuesday, August 21st at 1:00PM for the Tampa REIA Onsite Renovation Group hosted by Jim Miera, to learn all about finding, funding, fixing, and flipping houses for big profits. This month’s meeting will be held at 1953 Promenade Way, Clearwater, FL. This project is a 4 bedroom, 3 bath, 2171 square foot home with a 2 car garage and pool. This home is being rehabbed by Lisa Patella from Premier Pinellas Residential, LLC and is 90% complete. Don’t miss the rehab story on this unique property which has many lessons to be learned. For example, this property had a major ground settlement issue and 72 pins had to be added by the rehabber. Wait till you hear the story! Come join us! 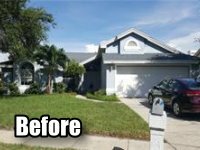 The Tampa REIA Onsite Renovation Group is an exciting educational and networking group that focuses on the acquisition, renovation and retail resale (fix & flip) or rental (buy & hold) of single or multi family residential homes in the Tampa Bay Area. The purpose of the group is to allow both new and experienced rehabbers and investors to meet, network, share knowledge and learn from each others successes and mistakes while getting “hands on” experience at real rehab properties.